The US Product Safety Commission reports 29% of the 17,000 TV tip-over injuries in 2011 requiring emergency medical treatment involved children under 9. Tip-over traumas cause the death of a child on average every three weeks (source: safekids.org). 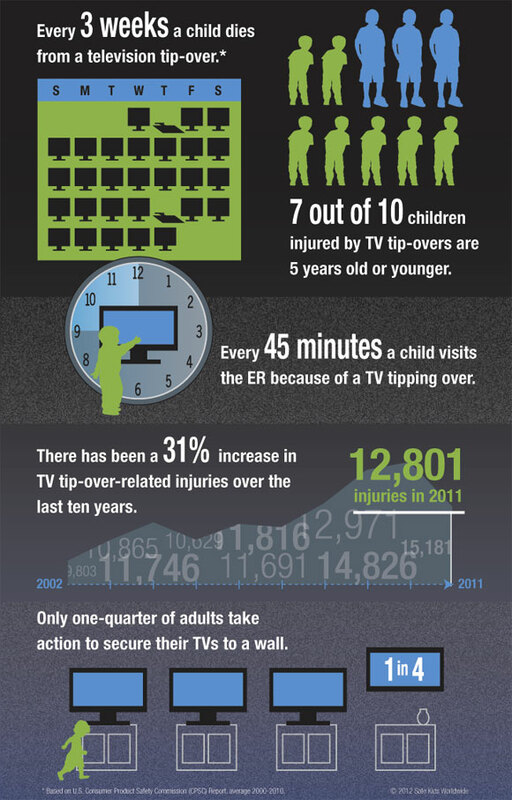 An epidemic of TV tip-over injuries should be of great concern to set manufacturers. Inexplicably, instead of engineering solutions that improve set stability, new “form over function” pedestal designs from major manufacturers are even more unstable than the injury-causing previous generation. One example: In 2013, Samsung changed from a traditional center pedestal to a boomerang-style design that extended the set’s full screen-width on its F8000 HDTV and F9000 Series sets. HD Guru found this new design to be significantly less stable than previous versions. If the outer edge of the pedestal exceeded the width of the furniture that you place the TV on, the set would easily tip over. In fact, three professional TV reviewers that I know of ended up accidentally tipping their review units. For its 2014 models, Samsung corrected the issue by redesigning its sets’ pedestals to be closer to the screen’s center. However, many new TVs coming from Sony and LG abandon the legacy center pedestal in favor of feet extending out front and back from the screen’s edge. These new designs create a potential tip-over hazard. Sony plans to start selling 12 televisions with this new stand design in March. As for LG, its entire 2014 line of big-screen HDTVs plans will have similar, wide-spaced feet. Along with spindly pedestals, another problem increasing the likelihood of tip-overs is a lack of detail in the TV stand dimension specs coming from retailers and stand manufacturers. 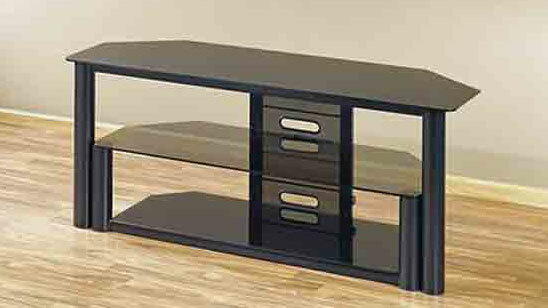 A number of TV stands sold by Best Buy and other dealers do not have a rectangular top surface. For example, check out the picture below of one of Best Buy’s best-selling stands, the Init model NT-MG1158. 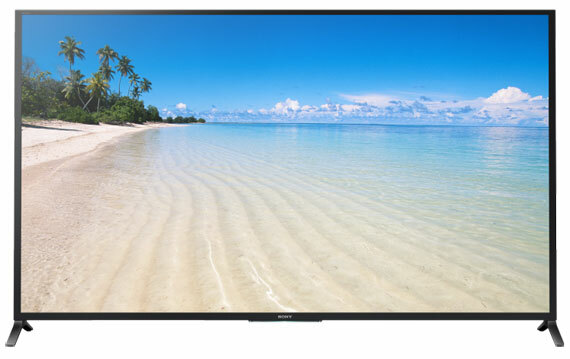 The specs on the company’s website state that this model will hold up to a 60-inch TV and list its dimensions as 58 inches wide and 20 inches deep. However, those specs are for the maximum width and depth of the stand’s non-rectangular top. The depth where the angular cut-out are is not provided. How will Best Buy’s sketchy specs create problems? Here’s one scenario. Sony’s forthcoming 60-inch KDL-60W850B requires a TV stand with minimum depth of 12 5/7-inches to support it. 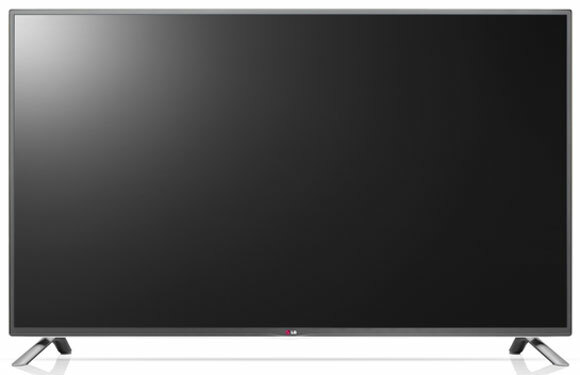 Can the Init NT-MG1158 accommodate Sony’s new HDTV? There’s really no way to know without breaking out a tape measure and physically measuring the stand’s top surface. Two weeks ago we notified a Best Buy spokesperson about the lack of detailed TV stand dimensions on the company’s website. We also asked if it plans to provide more thorough specs to help consumers avoid purchasing stands that won’t properly support the new TVs from LG and Sony. To date we have not received a response. We also located the Init website and called its customer service number (Init is a Best Buy house brand owned and operated by the company along with other brands such as Insignia, Dynex and Rocketfish). The customer service rep was not able to provide detailed top dimensions for the Init NT-MG1158. Sanus, a large manufacturer of TV stands and mounts, also fails to provide a complete set dimensions for a number of its non-rectangular-topped models. Of the three models we checked out at random on its website (BFAV344, BFV 53 and BFV48), none provided sufficient measurements (both minimum and maximum width along with depth for the stand’s top surface). HD Guru asked a Sanus representative about the issue and whether the company planned to update its product specifications. Again, we have yet to receive a response. Ironically, Sanus financed a TV tip-over study conducted by safekids.org, so the company is obviously keenly aware of the issue. The company's comment, which came in after publication of the story, can be found below. There are a number of precautions that new TV buyers can undertake to eliminate or reduce the risk of a tip-over. If you plan to install your set on a TV stand, first measure the maximum width and depth of the feet or pedestal and then measure the stand’s top surface. If the TV doesn’t fit, meaning its pedestal or feet won’t be 100% supported, do not place it on the stand—you will need to return it for a larger model (If an LCD TV does tip over, its screen will most likely crack. This will render it worthless as panel replacement parts and labor costs typically exceed the replacement cost for the TV.). A number of devices are also available to help prevent TV tip-overs. 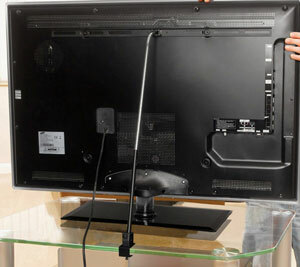 Inexpensive straps sold by Sanus and others attach to a TV stand to prevent forward tip-overs. These are useless for preventing rearward tip-overs, however. A better option is a solid bar that supports the TV in both directions. One such device made by Peerless is its AV ACSTA1-US Stabilis Home Safety Kit, it sells on Amazon.com for $20.99. While we have not used this safety kit, we are very familiar with Peerless mounts and have always found the company’s products to have exceptional build quality. A better and safer alternative to TV stands is to hang your set on a compatible wall mount (Unfortunately, only 25% of TVs are wall-mounted according to safekid.org.). Carefully follow all manufacturer instructions and anchor the mount by securely fastening it to wall studs (never use sheet rock toggle-type bolts) using the screws that came with the mount. For anyone who is not familiar with carpentry, we recommend paying for a professional installation. We at HD Guru would like to see more dealer/installer awareness of the TV tip-over issue, especially if they plan to sell the 2014 Sony and LG models mentioned earlier. We also urge TV stand makers to revise their specifications to accurately reflect the true dimensions of their products. To learn more more about TV tip-overs, read the latest reports on the issue at cpsc.gov here and here and from Safekids.org. This story was originally published in HDGuru.com. Two manaufacturers provided comments to HD Guru after publication of this story. I just completed writing a long comment to a large TV manufacturer after doing much research on the purchase of a new HDTV and TV stand. I am designing setting up a Home Theater in my living room. I have drawn a scaled 2D CAD drawing of my living room to do this. I decided the maximum TV size can be 60” diagonal and the longest TV stand it will sit on and hold my AV components and center speaker should not be over 55-56” long in order to fit the HT setup into my current living room arrangement. I reviewed TVs and stands ad infinitum (meaning I put a lot of time into this). I will spare your readers all the details (and there are many). The bottom line is I had just come to the conclusion that the new style stands you are referring to may indeed be more troublesome regarding potential safety issues. Not only that, this type of design might really hurt rather than help TV sales as many people will come to realize they have to go out and purchase a new wider and deeper stand for their new TV, and stands can be costly. I not only use autocad but have in the past been involved in ergonomic research. Manufacturers should pay careful attention to your concerns and look for ways to make their stands not only safer but also more accomodating as related to the TV stands or consoles folks will be placing them on. I also agree that there simply just arent enough specs provided by most manufacturers or resellers of TV stands/consoles to allow consumers to make a confident and correct decison about which TV stand or console will best handle their new TV, as well as accomodate audio equipment, including speakers, for Home Theater. It looks like I may go out today and purchase an HDTV on clearance from last years model line. This TV uses the older centered pedestal and it looks like it should fit onto the TV stand I plan to purchase and should work well in my new HT living room setup. That stand, though not the same one, looks remarkably similar to the one you have pictured in this article. I work in a retail store that sells televisions. Since most manufacturers have moved from the center stand technology to the V type stand the complaints I hear from most of my customers is that they don’t like the V type or the new stand doesn’t fit their on the table that held their last TV. I know in my case I wanted to replace my TV with a new 40” but the V type technology will not fit on my TV stand. I was able to find a TV with a center stand that will work just fine. I have had several customers ask for TVs that have the old stand. Is this a problem in the industry? This presents a problem for me as well. I place mine on the dresser in the corner of the bedroom and the new legs severely limit the direction I can turn it and still have the legs on the dresser. Would much prefer center pedestal. I just bought a Samsung 32” TV that has legs rather than a stand, but for the life of me cannot figure out how to get the screws into place in the cavity to screw them into the TV! Even if I can get them attached, does not seem very stable. Any suggestions? Your owner’s manual should have instructions for installing the legs properly. Once installed, though, the TV may still not seem especially stable - that’s the issue we are addressing in this story. You may want to consider the safety strap we mention above. Is it safe to place two flats creeps t.v.’‘s back to back from each other (basically two tv’‘s on the same stand inches apart) will they overheat or glitch??? LCD TVs don’t generate much heat, so I don’t see any issue placing them near each other on a stand. And there should be no reason why they would cause interference with each other, either. We’ve seen many applications of LCDs being run next to each other (sometimes dozens at a time) with no issues.